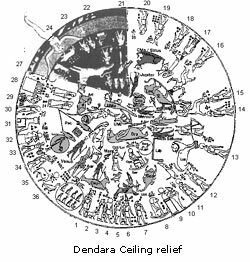 Unlike Mesopotamian religion, which gave precedence to the Moon, the use of a solar calendar meant the Sun-god largely dominated Egyptian religious doctrine. The Sun was viewed as the principal force of the universe …the divine creator of all things, the master of time and of the seasons. One Egyptian pharaoh, Akhenaten, who reigned around 1300 BC, even dispensed with gods in human form and regarded the actual solar disc, Aten, as the one true living god. His 'Hymn to the Aten' describes a deity whose power permeates all aspects of life, thus effectively superceding the traditional Egyptian pantheon of gods. Exclusive worship of Aten lost popularity after his death, but the cult of the Sun always remained an important royal and state cult. Worship of the Sun took place in various forms and under many names: Ra, Aten, Ra-Horakhty and Amon-Ra being most common. Usually, the Sun was considered a just and benevolent god, but his destructive power was also recognised and he was regarded as an enemy to farmers because of his power to parch the land. The orthodox Sun-god was Amon-Ra, originally known as Ammon, Amon, or Amen, and later identified with the Greek Zeus. Amon-Ra was a fertility god who was associated with and symbolised by Rams. It is of note that the Ram influence surfaced around the period of the Great Year, the Age of Aries. 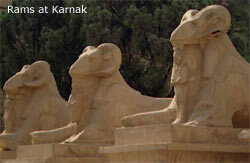 The temple of Amon-Ra at Karnak includes an impressive avenue of Rams and Rams were held sacred to him, inviolate except once a year, when they were offered in sacrifice. The earliest settlers of the Nile river valley worshipped the falcon deity Horus as the god of the sky and in the Book of the Dead the Sun is depicted as the right eye of Horus with the Moon represented as his left. The Sun was also symbolised by the mythical Bennu bird (or Phoenix as it was known to the Greeks), which dies in its own fire and rises from its ashes, symbolising death and resurrection. The worship of the Sun and the sky god Horus overshadowed Egyptian celestial mythology so much that, apart from the Moon, the five visible planets appear insignificant by comparison. Known as 'the stars that know no rest', they were portrayed as deities sailing across the sky in barks with the superior planets generally looked upon as manifestations of the sky god Horus. Mars was known as 'Horus the Red' or 'Horus of the Horizon' and usually depicted as a red flamingo. Jupiter, believed to be a revealer of secrets, was often symbolized by a falcon-headed god with a star over its head and known as 'Horus who illuminates the Two Lands' (a reference to its brilliance), 'Southern Star of the Sky' and 'He who opens Mystery'. Saturn, whose symbol was a square, was known as 'Horus, Bull of the Sky' and represented by the figure of a man or falcon with a bull's head. Little is known of his characteristics except that the use of the term 'bull' was frequently employed as a reference to strength and power. In most astrological depictions, Venus and Mercury are shown standing apart from the superior planets. They were thought to have dual natures because they appeared only in the guise of morning or evening stars. Venus was known as 'god of the morning' or 'the star that crosses', which may be a reference to the fact that it is only observed around the east or west horizon. It was originally depicted with the head of a heron-type bird, later as a two headed falcon. Mercury was attributed a distinctly malevolent character as an evening star and associated with Seth, the malicious son of Ra, who personified evil, darkness, thunder, storm and all things inexplicable. According to Neugebauer and Parker's study of astronomical references and drawings, the Egyptian name for Mercury in this form is Sbg, 'unknown', with references to the planet frequently accompanied by the name of Seth or a representation of him with a beak shaped nose and long ears. Some texts read "Seth in the evening twilight, a god in the morning twilight" and as a morning star its nature was much more beneficial, offering a closer resemblance to the characteristics we associate with Mercury today. In this form he was known as Sebek, 'the excellent one', depicted by a human headed figure and symbolised by a scroll. The Moon, as Khonsu, was worshipped with great honour at Thebes in the form of a human headed child-god, the son of Amon and Mut. He was known as 'the Traveler' due to his rapid movement through the heavens, and frequently shown wearing the crescent of the Moon upon his head. The goddess Isis was also seen in the lunar image and one myth speaks of Isis being beheaded by Horus and lent the head of a cow by Thoth. Jane Sellers, in her book The Death of Gods in Ancient Egypt, has made a strong case in showing that the myths directly reflected celestial events, Isis here being seen in the Moon's eclipse by the Sun and returning in the appearance of the Moon's first horns. The main lunar deity was Thoth, god of Wisdom and Learning, who embodied many of the principles currently attributed to Mercury. He is reported to have invented arithmetic, geometry, medicine and astronomy and was known as the god of Letters - the great Scribe and Secretary to the Gods. But whereas mercurial energy is nowadays considered to represent a mainly rational, intellectual capacity, in the form of Thoth - a revered magician, the one who had knowledge of the magical formulae needed by the dead to pass safely through the Underworld - we see how the essence of such knowledge was held to be far more profound and spiritual. Thoth was the personification of the Mind and Intelligence of the Creator. His influence over writing was an expression of his sacred powers since the ability to define concepts in words, both visually and through sound, was considered a supernatural gift. Words themselves, and the way they were constructed, were conceived as magical symbols, mirrors of the Divine Mind. Spoken with proper intonation and with the correct spiritual approach, they were the means to summon the gods, heal the sick and command obedience. Writing was a priestly study, held in awe by the uneducated - a magical, mystical art. There are many fine representations of the zodiac in Egyptian temple reliefs but, although once thought to date back several millennia before the birth of Christ, recent dating techniques suggest they cannot be considered older than the 3rd century BC. One of the most spectacular is the ceiling relief from the temple of Hathor at Dendara. Roz Park, in her forthcoming book Astrology in Ancient Egypt, believes the mural depicts a celebration of the convergence of the sidereal and tropical zodiacs and the ingress of the vernal point into Pisces. The zodiacal constellations are easily recognisable and the planets are located in the signs of their exaltations, with the 36 decans clearly marked around the perimeter. Evidence shows that the concept of the zodiac is not native to Egypt because it is predated by the Mesopotamians by two centuries. What is clear, however, is that the zodiac contains much Egyptian imagery and mysticism which may have been imported into Mesopotamia at some earlier, unknown date, but which certainly continues to influence astrology as it is practiced today. I am grateful to Roz Park for her feedback and help in preparing this article for publication. 11] There are also references to the white and black eye of Horus, being the Sun and Moon respectively. 12] Penguin Books, London, 1992. 13] The Bible teems with examples: "In the Beginning was the Word, and the Word was with God, and the Word was God" is one of many references to the ancient belief that symbols of the intellect were symbols of the Divine. 14] Republished in 1980 by Spring publications, translated by Charles Boer.